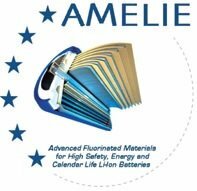 The focus of the project is on the development of fluorinated electrolyte/separator and binders in combination with active electrodes for high performing, safe and durable Li batteries. The main deliverables of the project are the development of cell prototypes capacity > 10 A.h on which performance will be assessed towards objectives for EV and PHEV applications. Capacity of cells will target more than 200 Wh/kg with improved life time: > 1000 cycles, High calendar life: > 10 years, cost and high recyclability / recovery / reuse will be a key focus as well. The utilization of higher performing ‚inactive’ organic materials (polymers and ionomers) will enable to reduce the amount of the same materials while increasing the energy and power densities of the battery, and consequently decreasing the cost per kWh of the final battery. In addition, the reuse of the components will contribute to the cost reduction of the battery. To this end a complete Life Cycle Analysis of the new battery components will be performed. As the developments in this field are extremely interconnected, improved Lithium ion batteries for automotive sector can be manufactured only by the synergistic optimisation of all their components: active materials and binders for electrodes, gel polymers, lithium salts and solvents for the ionic conductors. Although innovative materials are a key lever of such improvements, the cell design will be essential for both improved performances and safety.